Discussion in 'Rendering Technology and APIs' started by MarkoIt, Sep 26, 2013. I wrote "highest settings". The 40% case is not using highest settings. So it's not 17.3 % (probably a typo? ), but 40,1 % for 1600p @Ultra. It seems, that Guru 3D and other websites have correct numbers. I'm also curious to see what happens with 45W (or lower) APUs, since their CPUs often have to throttle quite a bit in games. Ok, thank you for pointing it out. Obviously, from the way these press releases are presented, the benefits are not spread across the board .. they had to highlight and separate GPU and CPU limited scenarios .. and then put on some average uplift (13%) with 4 different CPUs @1080p ! One curious thing, most benchmarks are run with no MSAA. I remember seeing direct benefits of Mantle with regards to MSAA performance, so what gives? stop moving goal posts. this statement is wrong. Ah I see the problem, you don't understand how words work. never been on NeoGaf, and im not a kiddo old timer...... i just hate pretensions BS, be honest about your agenda dont try to dress it up. My agenda. Please tell me, what exactly is my "agenda" here? Again, you really should know what words mean before using them. You're lost. I'm looking forward to see more benchmarks. Any clue when 7000 series and R270/280 will be supported? AMD Catalyst 14.1 Beta will support ALL desktop GCN products, though we are working with EA to further optimize performance on 280X, 270X, HD 7000 and HD 8000. We have asked EA to update their blog to reflect this. That's it. All this presentation was not well thought about. Hell, even Mantle itself was presented in different ways right from the beginning. Goalposts changed a lot from its introduction. The way I picture all this is like having different persons from AMD/DICE saying slightly different things. It lacks a common voice and message. It's full of noise and static. That is not how a decent company Marketing should work. I have the impression that actually most of them are presented with 4xAA? I do not call this being "negative", but "demanding". Especially after all the hype, the initial outcome is anything but clear. For the sake of impact, they should have waited till Mantle was more polished. They brought this on themselves by promising a patch by December when they should have exercised more caution. In the end, turns out that it was not ready for prime time, not even today. Like I said, from a company as big and important as AMD, you should expect better judgement. Given their financial situation and the numbers they invested already in Mantle, this is not a good sign. AMD confirmed that 14.1's support all the GCN's like expected, and that they've asked DICE to correct their article about it. You do come across as very negative to everything regarding Mantle. Could be that something gets lost in light that we are reading it on a forum, which doesn't always shows the grey tones, but still. Mantle is free. Its released now in beta and brings performance improvements already for the majority of GCN users if to take Repi's benchmarks as example. If you don't approve of those benchmarks, rest assured that Mantle will be benchmarked across the internet the following days, now that its been released. Mantle is a new API thats been build from ground up. It does contain more then just CPU improvements, considering the amount of control it gives to the developers. AMD shouldn't have waited until it became more polished. I'm very happy that they released it now in its beta form and would prefer to see it evolve during the year then to wait. It will become more polished, but we now get a chance to see it in action. Be happy that it has been released. You cannot demand anything anyway, so instead look at this as an enthusiast and see what potential it have instead. The schedule is DICE's schedule, the delivery dates have been put forth from DICE as has the patch / implementation schedule. We have a choice to either support it or not support it; obviously we are supporting it every step of the way. BF4's implementation has always been with a beta phase of Mantle rather than a full release phase, hence the reason why there isn't a full developer kit / SDK available yet. Both the API and (I'm sure) the first implementations will continue to improve. That said, the gains are already there - we are seeing 10% or better gains in pathologic GPU bound cases one an inital Beta release API the first release of port of a game that was not originally designed for Mantle, in CPU bound cases the scaling is even larger; this is with everything in its infancy. As we see maturity we'll see developers going from ticking off their big ticket CPU limitation items and using Mantle features more that can bring more scaling in GPU bound cases as well. What about how things are being presented. Are you honestly perfectly happy with that? For a technical point of view it might make sense to presented like that, but from a layman/marketing perspective I am not sure. The lower numbers were taken with a Core i7 4960X, which is a $1000 CPU. The purpose of Mantle is to have gamers taking full advantage of their GPUs without requiring a $1000 CPU. What will be interesting is to know the difference in performance between a $1000 Intel CPU and a $180 AMD CPU. What is not interesting is to show how a very expensive CPU won't benefit at all from Mantle, because that was a given from the start. Whoever decided to leak those numbers that way clearly harmed AMD's whole point with Mantle. Mantle, being the huge game changer AMD expect it to be, was thrown out the door like an ordinary driver update. Hell, I even remember nVIDIA making a fuss about a "bing bang" driver update that was nothing special some years ago. Mantle surely deserved a more polished presentation? Including reviewers numbers right of the bat. Including reviewers numbers right of the bat. I'm pretty sure, that's the way it was planned. My expectation for Mantle was basically this. It's something to significantly help AMD's own CPU's first and foremost, was never expecting big gains with high-end GPU's and fast CPU's. However, what I also expected from Mantle (or at least titles where Mantle is taken advantage of it) is much better frame pacing overall - basically more consistency in frame times, especially with lower-end CPU's. 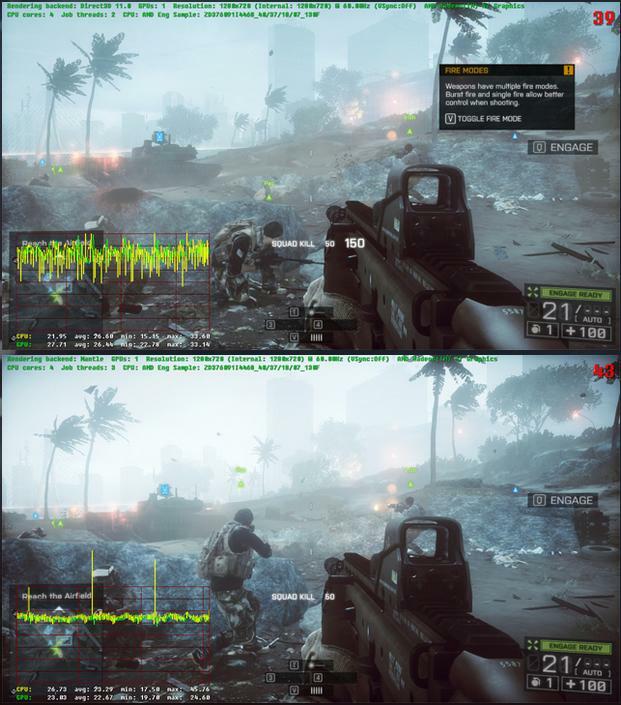 By looking only at the two frame rate counters, you could say "WTF? Mantle only gives a 4fps boost!" - but then look at the graph on frame times in the lower left. Despite the two huge spikes I see in those pictures, I wonder what impact Mantle have on game smoothness, seeing how smooth the frame delivery seems otherwise under Mantle compared to the DX picture. Ashes of Singularity - a.k.a. the game that sprung from that Mantle demo. Proper Mantle testing in muliplayer games.